Leaking roofs can cause damp and decay issues within a very short space of time and replacing broken or missing tiles can save thousands of pounds in future maintenance for relatively low cost. MT Roofing in Cambridge are happy to visit and remedy roof slate or tile issues no matter how small the problem. You can trust our professional roofers to give advice on the state of your roof but won't pressure you into having more work done that is necessary. Different roofing types (slate, tile, lead) have different lifespans but all will need replacement at some point before water starts to penetrate and cause damage to the structure of the building. Here at MT Roofing we have years of experience in renewing all types of roof material and can re-use existing roofing slates or tiles where possible to preserve the look of your property and reduce the overall cost whilst still extending it's life. Even when your looks OK from the outside there can be hidden problems underneath. If your ageing felt has started to deteriorate then any slight moisture that finds it's way under the tiles can start to rot the timbers. 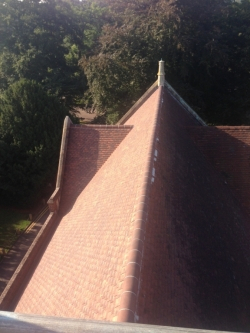 We can remove your existing roof, replace the felt with a modern breathable membrane, renew the battens and then replace the existing tiles or slates if they are in acceptable condition ensuring the roof will provide many more years of protection. Sometimes when a roof has no issues with the tiles or slates there can still be problems with water penetration because the flashing or leadwork has deteriorated or started to come away from the building. Our roofing contractors will renew and replace where necessary to make sure that water cannot get in and any further damage is prevented. Whether you are building a new extension to your home or starting from scratch and designing and building your dream house we would be delighted to be able to 'put the icing on the cake' as it were and supply and fit your new roof. Our many years of experience means we are ideally placed to provide a fast, efficient, quality installation at a price that won't break the bank. All our work is fully guaranteed for peace of mind and we are happy to provide references and examples of our previous work so you can be assured that the job will run without issue. We are ideally placed to quote for any large scale roofing projects because we are a combined roofing and scaffolding business and have completed many jobs in the Cambridge area including work on Cambridge University colleges, schools, council buildings and shops, offices, blocks of flats and warehouses. Our prices are competitive and our huge range of experience mean we should be considered for all big roofing and re-roofing contracts in the Cambridgeshire, Essex and Hertfordshire areas. 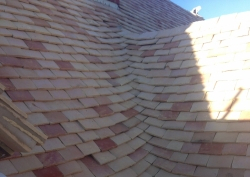 Take a look at our portfolio of recent roofing jobs in Cambridge and contact our Cambridge Office for more details and to discuss your requirements.